Photo captions: 1. Exsa grapes packed in compostable inner liners and carry bags for export to the EU. 2. The Exsa compostable bag trial team: Anna Steytler of Superior Packaging (second from left) with Johan Jordaan (left), Wilhelm Joubert (second from right) and Hendrik Rabie (right) from the Exsa compostable packing material team. 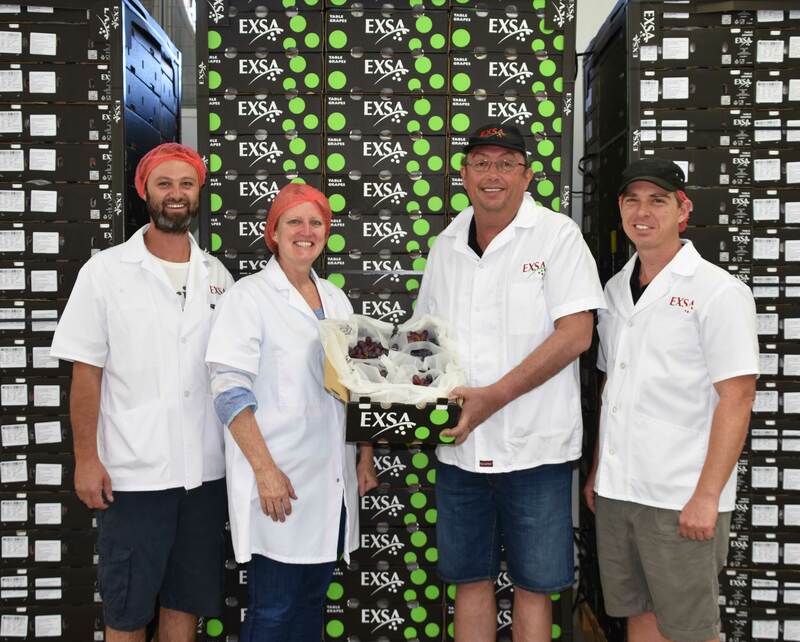 They are holding a carton packed with the compostable inner packaging and are standing with a pallet of Exsa cartons packed using these liners. 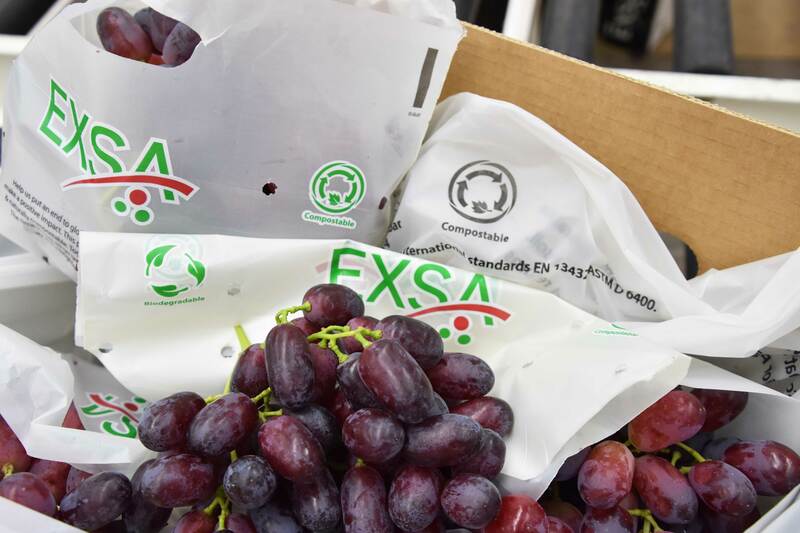 As part of the global initiative to find alternatives to single use plastics, Exsa has teamed up with Superior Packaging and have recently initiated a trial of compostable inner packaging materials for the export of their table grapes. The first consignment of grapes packed in these compostable carton liners and carry bags has already arrived in the Netherlands. This environment friendly initiative has been well received by Exsa customers and has also received good publicity in the Dutch Fresh Produce media. Exsa’s next shipment of grapes packed with these liners and inner carrybags is currently in transit to Exsa’s receivers in the UK. This initiative is a first within the South African Table Grape sector. Superior Packaging and Exsa have been collaborating for some time on the design and manufacture of these items for the trial to replace the traditional single use petroleum based plastic carton inner liners and carry bags with compostable alternatives. These new materials are compostable and biodegradable. Compostable means that the product can be disposed of with organic waste as it has the ability to disintegrate completely into natural elements within a composting environment. This process is usually completed within a few weeks and leaves no toxicity in the soil or runoff water. The resulting compost has a nutritional value for plants and can be utilised in plant production. Wilhelm Joubert of Exsa’s technical team is also currently conducting trials on the composting process of these liners. These items are manufactured from natural components which include resins such as Thermoplastic Starch (TPS), which bind the materials, and biopolymers that are made from a variety of plant based sources such as corn, wood pulp and general biomass. The production of these natural, plant based materials is sustainable as managed forests are good for the environment, producing clean air, clean water and facilitating carbon storage. As these constituents are natural products, they are processed at lower temperatures than the hydrocarbon (plastic) derived equivalents and so require lower energy levels during the manufacturing process. These products are food safe and certified by the relevant food safety industry standards including the US Food and Drug Administration. The packaging is both compostable and biodegradable. The basic distinction between compostable and biodegradable products is that compostable products require a specific setting in order to break down, whereas biodegradable products break down naturally. Typically composting is a faster process than biodegrading.